The new 735 replaces the Cat C15 ACERT engine, rated at 441 net hp, with the Cat C13 ACERT, rated at 428 net hp. The new 730 and 730 EJ continue to use the Cat C13 ACERT engine, rated at 367 net hp. The C13 engine used in all the new trucks is available in configurations to meet emissions standards of both highly-regulated and lesser-regulated countries. 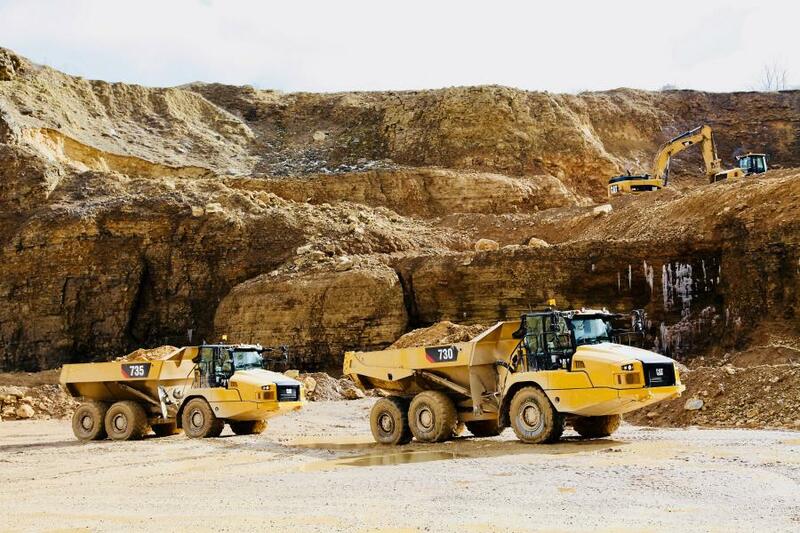 Three new Cat articulated trucks — 730, 730 EJ (Ejector), and 735 — have been extensively redesigned, enhancing the field-proven features and performance of their C-Series predecessors (730C2, 730C2 EJ, and 735C) with new operator stations — including new controls, transmission-protection features, new hoist-assist system, advanced traction control system, new stability-assist system and a fuel saving ECO operating mode. In addition, the design of the 730 and 730 EJ is enhanced with automatic retarder control and a hill-start feature. The 735 retains these features from its C-Series predecessor and further incorporates significant design refinements that include a new Cat C13 ACERT engine, Cat CX31 transmission (also on the 730 and 730 EJ) and structural and dimensional modifications that reduce empty weight by 22 percent, while retaining the productivity of the outgoing 735C. These features combine for an up to 18-percent gain in fuel efficiency. The cab's new external “spinal-ROPS” design incorporates a rear-quarter glass that eliminates a structural pillar in the C-Series design, for enhanced rear visibility. Also, a new “wake-up” feature initiates the machine's displays when the door is opened. The door is of a lighter, stronger design with a shut-assist feature for improved sealing against dust infiltration. The overall cab design results in lower inside sound levels at 72 dB(A), a 7 dB(A) reduction compared to previous models. Optional new infrared glass reduces solar heating inside the cab, and left- and right-hand sliding windows increase ventilation and facilitate communication with workers and the loading-vehicle operator. A new, automatic climate-control (HVAC) system positions more vents above and behind the operator for increased heating and cooling efficiency. A new heated/cooled seat is designed to give operators increased adjustments that allow “dialing in” personal-comfort settings; also, the passenger seat now uses a flip up/down design and added cushioning. For added safety, a new lighting system, controlled via a ground-level switch, illuminates the cab's entry steps and hitch area. Optional integrated payload lights provide an external indication of payload levels for the loader operator. Optional long range, LED work lights improve visibility at night or in situations of lower visibility. New cab-mounted mirrors, including a front-visibility mirror, enhance all-around visibility for the operator. Exterior cab features include an improved flexible lower fender and a low-profile exhaust stack that need not be removed for transport. The optional Cat Connect PAYLOAD technology calculates payload via sensors on the walking-beam suspension, and load-status lights at all four corners of the cab roof ensure visibility to the loader operator from any angle. In addition, the standard Cat Detect/Stability-Assist system monitors the working angle of the tractor and body, as well as the grade, and cautions the operator if the machine is approaching the set threshold angle, stopping the dump process if continued action may result in potential tipping. Further enhancing safe operation is the Cat Advanced Automatic Traction Control system, which features refined technology for proactively applying differential locks to avoid wheel spin. Also, a “terrain-based,” throttle-smoothing system prevents acceleration surges when traveling over extremely rough terrain that makes keeping a steady pressure on the throttle pedal difficult. A new combined transmission-and-hoist lever provides efficient, single-lever control of vehicle speed and body-hoisting functions to reduce operator effort and to automate repetitive operations. A switch in the cab allows operators to choose either manual or assisted hoisting control, the latter selection automatically applying the waiting brake, shifting the transmission to neutral, and raising the body to maximum angle at engine high idle. Assisted hoisting returns the body to the lower position at the flick of a switch. Both raise and lower functions feature automatic cushioning and speed reduction at limits of movements. The 730 EJ is designed to eject loads while traveling, providing positive dumping of the entire load, and also to work in areas with overhead restrictions and with soft underfoot conditions with improved machine stability.